We took a walk along the back of the property. I wanted to get a video of the river so you could listen to the water as it rushes along. I asked Papa (my husband) if he would help me with his camera. We walked slowly along the back property and did a short video. This is all very new to us and we still don't know what we are doing, but it was fun. I have no idea how to add text to the video, or how to do much of anything. Any advice would be much appreciated! Also, are you interested in my doing videos? If so, what kind would you like to see? The spring weather here is wonderful. We were out with some of the grandchildren yesterday. They enjoyed gathering sticks and putting them in piles for us to discard. We are raking and cleaning up the property. 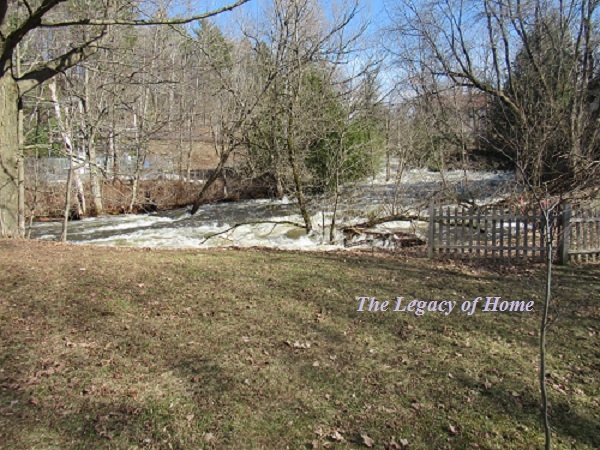 Most of the snow has melted now. I noticed, in my little flower garden, that my tulips have started to come up! Always Remember - The House Comes First. Inspired by D.L. Moody's Mother - Poverty in the 1800's. 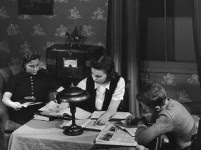 Old Time Living - Retirement Planning for the Poor. 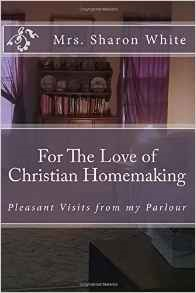 Find Home-keeping Inspiration, in Mrs.White's book - For The Love of Christian Homemaking. Paperback, 274 pages. Good morning! I wanted to write a quick visit. I got up extra early today to get an apple pie in the oven. I need it to bake and then cool for 2 hours so I can wrap it up before I leave for Church. We are having some of the family over this afternoon for Easter. We will have pie and ice cream. I am also serving easy, buffet style, foods to make things very simple. Since it is Passover week, I also have to make a very quick batch of unleavened bread. Our local stores, for some reason this year, are not selling anything of the kind. I have always been able to purchase plenty for many years. But not this year. So I am making a very simple batch and it will only take a few minutes. So we will have the unleavened bread on hand, which is such a precious part of the season. I have been very ill off-and-on for several weeks now. But I needed to drag myself out of bed and "Make an Easter for the Family" as Connie Hultquist would say. I will be okay. My husband (who is disabled) and I learn to live in pain and suffering. He will say that he is going to suffer whether he is doing something in life, or sitting still and hurting. He chooses to do things and live, rather than do nothing and suffer. He will suffer no matter what. But we put on a happy face and enjoy the family and our home and all the wonderful blessings we have. Some of the grandchildren will be here this afternoon. I love when they visit. They require an enormous amount of work, but it is the greatest work there is. I love their smiles and laughter and their happy visits. Some of us will be going to church this morning. 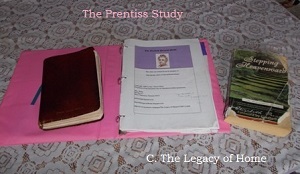 I had been home most of the winter and have not been to church from January of this year until the beginning of April. The bitterly cold, icy, Vermont weather was unbearable and unsafe for me to venture out. So I am extra thankful to be able to attend services. I may have to bring my cane for extra support when I go to the service today. I am completely exhausted and drained. (Last week I was shaking in church, I was so tired.) But I do have 2 of my grown sons who will be with me, and they will be dressed in their suits and looking very handsome. I call them my bodyguards. It will be a joy to go, whether I need a cane or not. And, of course, I can have a good long rest later in the day. For those of you who are not able to attend church, there are so many online options to watch or hear an Easter Service. I hope you are able to listen. I was reading about street vendors who sold Easter lilies and I thought how pretty that would be to have some beautiful flowers today. It is a joyful time! A Picture of some of my grandchildren - Confined to the Nursery. A "Thank You" from 2013 - Easter in Vermont. One of the most important things to learn in homemaking is how to set up a sick room. Sometimes a patient is bedridden for a couple of days. This can get dreary and depressing without pleasant care. The patient may be a young child or an elder. This family member is receiving special care in their own home. 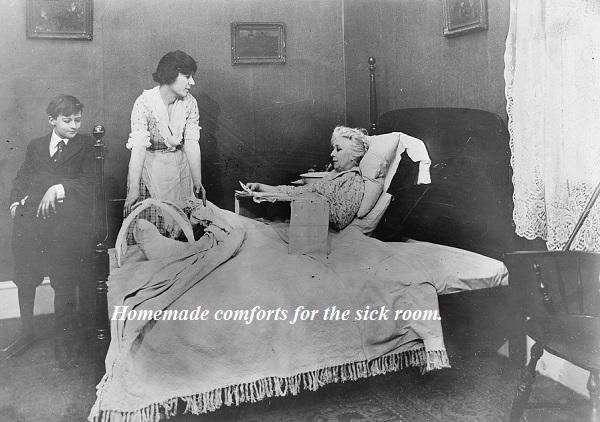 The housekeeper can do many things to make the sick room a pleasant place for both the patient, and the family. I was chatting with an elderly relative recently. We were talking about the trials of sickness and also of those in constant pain. She told me that, years ago, nursing homes were not common. She remembered an Aunt who lived in a "sick room" off the kitchen of the family home. She said, in those days (before the 1960's), it was common for the sick to be cared for at home. I did a brief bit of research on this and found a description of a nursing home (on one of the American government sites) to describe the nursing home as a place for those who need help in daily life but have no one at home to care for them. My grandparents lived with us when I was growing up. Grandmother was in a wheelchair and bedridden. 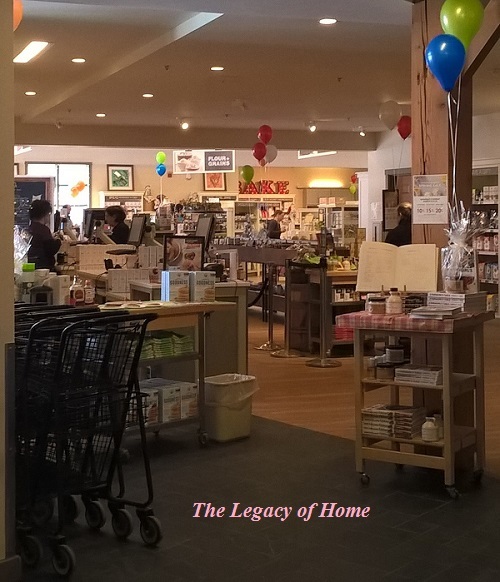 My mother was in charge of her daily care, as well as the care of our household and family. When I was very young, my mother would need to go to Grandmother's room, to spend time with her, or to render some service. Mom would telephone her sister and sit me in a chair. She would hand me the phone. My Aunt kept me busy talking so Mother could manage the sick room without having me underfoot. Everyone in the family had a part in helping whenever someone was in need of care. It builds character and gives us all the opportunity to do good deeds. It helps build strong families when this is done with willing and cheerful hearts. Perhaps there are many, these days, who did not grow up seeing the labor of tending an old - fashioned sick room. It can be a work of cheerful benevolence. I wanted to share some ideas on providing a pleasant room for those with a brief illness. For the comfort of the patient, it is nice to offer such amusements as word search puzzles, books, and even old fashioned television programs to make one laugh. My mother was a wonderful nurse, even though she had no formal training. She would take gentle care of a sick child, settling him in bed during an illness. She would bring in a tray for meals. There would be a little table or desk, beside the bed, for the thermometer. There was even a little bell for the patient to ring for help. Lots of pillows and cozy blankets were brought into the room. Mother kept a supply of essentials for sickness in a bedroom closet. This consisted of bottles of ginger ale and boxes of jello-mix, hidden away where the family could not use them as common treats. She never had to run to the store when an emergency suddenly occurred. There was always chicken in the freezer. She would start to defrost this and make homemade soup the next day. The patient would be served delicious, nourishing chicken soup for days. She would add a little rice, carrots, or delicate pasta to this as the patient began to improve. Mother also kept anti-nausea medicine and pain relievers in a cabinet, along with bandages, and hydrogen peroxide for first - aid treatments. She had an ice pack in the freezer to handle bumps or sprains. There was an ace bandage stored away if it was needed. For the patient who is contagious - with the flu or a terrible cold - they would not be allowed visitors in the room. They would be given a wet cloth to cool a feverish forehead. If they are not able to get up each day, Mother would bring in a basin of warm water and soap. She would take a cloth and wash the face and hands. This would help the patient to feel neat and comfortable. For those suffering for a time of pain, an injury, or from weariness, when a patient must be in bed, it is so nice to have the family stop in for short visits throughout the illness. The room should be kept as pleasant as possible. The room could be aired by opening widows for a short time, while the patient is in another room. The sheets should be freshly washed. A neat and clean room will help bring happiness. When Mother is the sick one, she could do her hair and makeup and put on a clean nightgown. This boosts her mood and makes it pleasant for those who visit her. During the times I have been bedridden from an illness, I have often had my children come in to read the Bible, sing hymns, make me laugh, and just tell me about their day. I enjoy using the telephone for short visits with grown children, especially during a sickness. Older children will stop in to see me, for a cheerful visit, before they head off to work or to some errand. I recently suffered from an illness that was exhausting and required a great deal of rest. It was such a blessing to have a pleasant room to enjoy during recovery. The sick room could be one's own room, a guest room, or whatever bedroom is most convenient to the kitchen. It should have cheerful curtains, soft lamplight, and peaceful decorations to help one recover from one's suffering. There ought to be a chair for guests and a handy tray - table for meals and tea. Fresh sheets ought to be available, both before a patient enters, and after they have recovered. After the occupant is well, the room needs to be thoroughly cleaned, aired, and disinfected, and put back "to rights." Sickness and injury comes to all homes, in all generations. 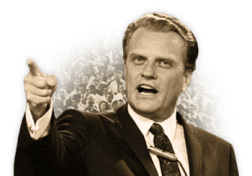 This is a precious time for prayer and ministry. It can draw our hearts near to God. Our gentle service in caring for our family during these difficult times can be accomplished with grace, patience, and love. "We have no right to murmur at sickness, and repine at its presence in the world. We ought rather to thank God for it. It is God's witness. It is the soul's adviser. It is an awakener to the conscience. It is a purifier to the heart. Surely I have a right to tell you that sickness is a blessing and not a curse, a help and not an injury, a gain and not a loss, a friend and not a foe to mankind. So long as we have a world wherein there is sin, it is a mercy that it is a world wherein there is sickness. "— J. C. Ryle, 1800's. 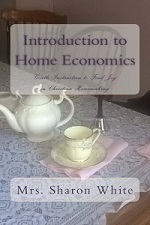 Four Generations Living in One House - Gracious Homemaking. Homemade Lessons from My Aunt - Manners Learned at the Finishing School. Every Home Should Have one - Housewife on Duty. This is the third post in my series of touring Vermont. (Please click on any picture to make them larger.) I have lived in this state for 16 years and rarely stopped to look at the sights. Starting last year, I made the effort to stop and visit some of the places that I see on my travels. This does not mean that I would need to spend money, but that I would take a few moments of rest and visit some of these places, instead of just rushing through life and never taking a scenic break. 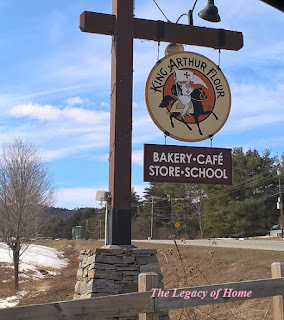 We were travelling back from an appointment in Southern Vermont last spring. It was getting close to lunch-time when the King Arthur Flour company sign appeared on the interstate. 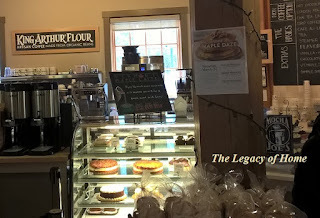 I was delighted and surprised when my husband took the exit and said we could stop at their bakery/ café for a quick visit and lunch. I cannot remember this ever happening before. We would normally eat a packed lunch or just wait until we got home. He did this, of course, to make me happy! 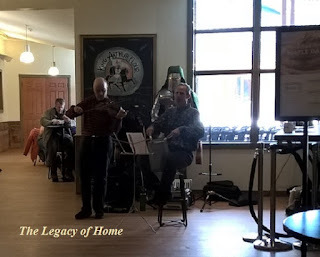 As we entered the building, we heard the wonderful sound of musicians! One of them was playing a violin or fiddle. It sounded so welcoming and fun. I love that they were entertaining guests as we wandered around the little bakery café and store. From what I understand, there is a baking school here as well. We did not have time to look around, But I have heard their classes are excellent. The little gift shop was bright and cheery. 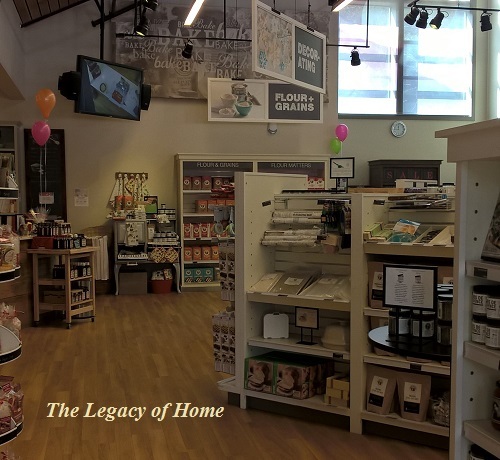 They had baking pans, utensils, baking mixes, aprons, treats, and much more. I had a wonderful time just browsing around. I had no intention of buying anything because we live on a fixed income. Shopping on impulse is not in our budget. But then I noticed some beautiful tea towels. I picked up one with lilacs embroidered on the front. I was just staring at it. I believe it cost about six dollars. I was so happy when my husband said I could buy it. "Why not?" he wanted to know. I suppose the budget could manage that amount. It was the only souvenir of this visit and it was a practical item. I looked around a little more and then we wandered back to the main entrance to find something for lunch. The café had a tempting display of brownies, cupcakes, cookies, and more. We chose pizza slices. We ordered these to take with us. We had to get back on the road. I think we were in the building for about 15 minutes. It was an exciting rest stop on our journey home. Very little money was spent and we enjoyed ourselves a great deal. 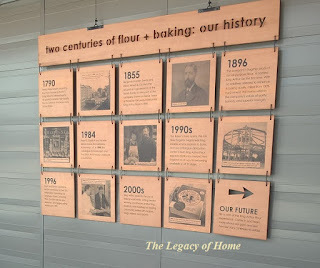 Thank you for going along with me on this very quick visit to the King Arthur Flour bakery. My next stop will be the Governor's Mansion, where we enjoyed Afternoon Tea late last summer. The First Tour was - A Vermont Christmas Tree Farm. The Second Tour was - The Trapp Family Lodge in Stowe Vermont. Finding Happiness at home - Poor and Pretty Living. 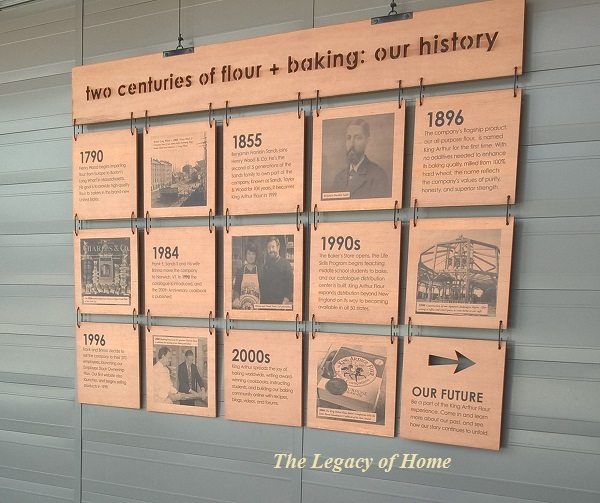 We Need More of This - Homemaking Propaganda. Nourishment and Frugality - Basic Cookery. 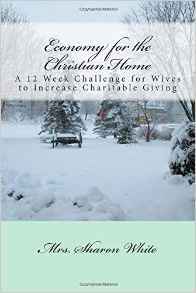 Read Mrs. White's book on Saving Money and Inspiring Charity -Economy for the Christian Home. Paperback, 110 pages. This is such a charming book in so many ways. The front and back cover illustrations are stunningly beautiful. 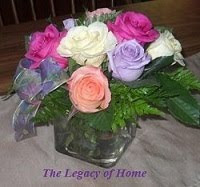 They evoke a calmness and a happiness for motherhood and homemaking. Inside, you will find more than 80 gorgeous, black-and-white vintage illustrations, many of them covering an entire page. These are so peaceful and inspiring to see. There are so many that I love, but the one on page 267 is my favorite. It is of a husband and wife, out walking in the snow. 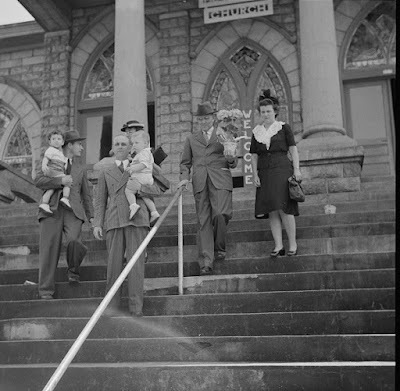 The husband is holding an umbrella to shield and protect his wife from the weather. He is looking at her so sweetly. They are dressed in beautiful clothing, perhaps from the 1800's. You will get a glimpse into another time in history - of the peacefulness of home and family - from the old days - just by looking at all the illustrations. These pictures are so much fun to see. 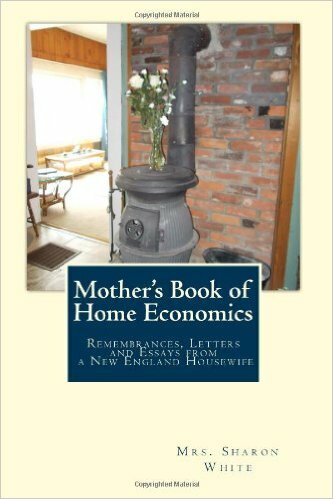 One morning, I had been reading this book and placed it on an end table when my grandchildren arrived for a visit. My 4 - year old grand-daughter immediately saw the book and picked it up. (It is a thick and heavy book. I wondered if she could lift it!) She sat right down on the parlour couch and spent a great deal of time looking at all the wonderful pictures. There are 40 chapters with such titles as "Mommy's Mittens;" "Bringing Back the Moral and Patriotic Stir;" and "A Walk will Do You Good." I have read about half of the book so far - here a little- and there a little. Each chapter is full of calming words of encouraging wisdom. There are many thoughts to ponder and to bring cheer and peace. Karen also shares personal stories from her own life which were fascinating to read. (I found myself smiling frequently. She has such a charming sense of humor.) There are little quotes sprinkled throughout the book from Charlotte Mason, H.W. 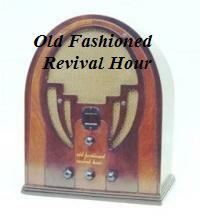 Beecher, Charles Spurgeon, Milton Berle, and many more. There are questions at the end of each chapter - to help us apply the lessons to our own lives and circumstances. 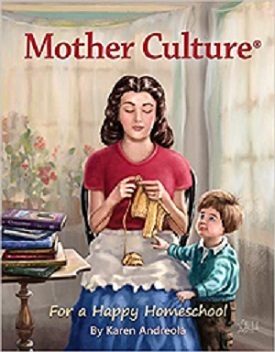 Each chapter is thick and full of ideas, wisdom, encouragement, and provides a rich education for the reader - in both motherhood and homeschooling. Readers will come away from reading this book with a sense of relief. They will have obtained a dose of courage to live each day with a happiness and a focus on the beautiful task of motherhood, wifehood, and home education. I am remembering all my 25 years of homeschooling my own children. Each spring, when the tax refund came in, I would order all our school books for the coming year. I would also choose a few books for myself. These were ones that would give me encouragement and happiness as a mother and home teacher. Karen's new book, Mother Culture: For a Happy Homeschool is one that I would have jumped to purchase immediately. It will get any mother through many school years. It will help bring her rest, peace, support, and wisdom for each day. It is an excellent book. *Disclosure: This book was received as a gift. A Financial Journal - My Husband's Money. Is This True? - Only Rich People Have Clean Houses. I Will Never Regret Staying Home with My Children - A Humble Parlour as a School of Theology.